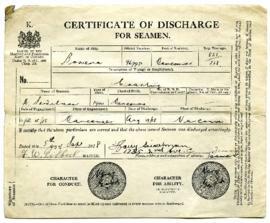 Certificate stating that Harry Seidelman was discharged from the Bowena ship on August  1918. 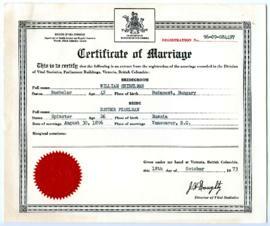 Certificate was issued on September 5, 1918. Black and white image of Esther (left) and Esther's two sisters standing with Bill (left) and Perry (right) on a doorstep of their house on West 2nd Ave.
Gangway Pass on the R.M.S. Niagara ship, dated February 9, 1918. Black and white image of three people sitting on a stoop or ledge - heads are not visible in the photograph. Photograph of Harry Seidelman aboard the Union Steamship SS Bowena in 1921.